High volatility again last week, or is it high really ? we've done a simple exercise on ES. 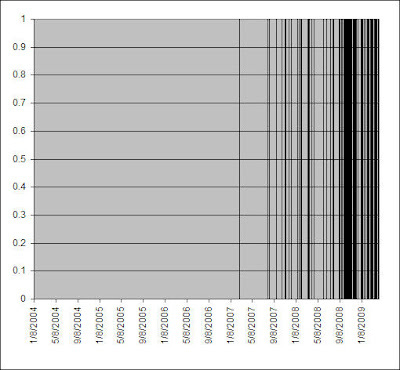 We've listed the log returns since Jan 1st 2004 and calculated the top and bottom 1/30 (i.e. 3.33%) and came up with some really amazing. 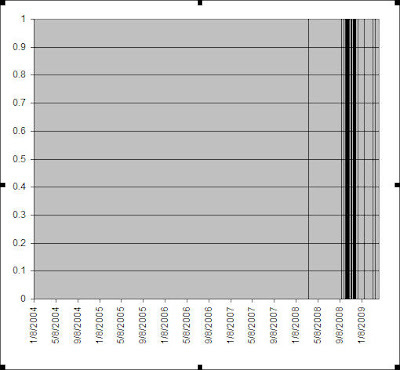 The first occurrence of a highly volatile day came only in Feb 07, then Aug that same year, but has become almost "normal" since Sep 08 : 43% so nearly every second trading day! 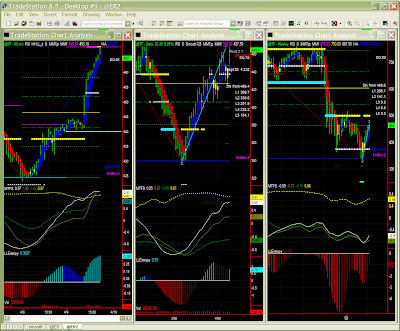 Now back to ES, after again a bumpy week. ES has reached stall level (~844) with a blue bar still so one could assume that the 875 target remains realistic. One realizes however that the MTFS white line is very overbought, calling for the much anticipated retracement to the 750-765 area. We shall therefore tighten our stops or take profits to prepare for the next slide. 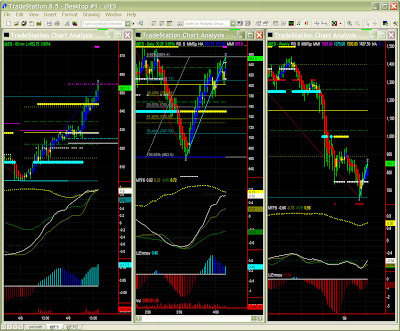 In the short term (60mins chart), ES is also overbought but does not show any sign of retracement just yet. Easter Monday is probably not the right time for this but a return to 820s range later on this week is quite possible indeed. Weekly outlook: no change from last week. Lastly, let's take a look at ER (aka TF) for any peculiarity: ER has already reached stall level on the Daily chart, equivalent to pivot on the 60mins chart, so retracement potential is strong even if limited at first. This could be an indication of a head & shoulder pattern forming. Here again, detecting it is only the first part of the equation. We'll have to wait for a confirmation in the next couple of days.